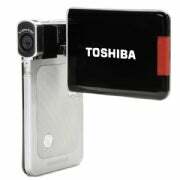 It may be thin and light--even for a pocket camcorder--but the ultraslim Toshiba Camileo S20 ($180 as of 5/7/2010) packs more features into its frame than any high-definition pocket camcorder we've tested to date. Along with 1080p high-definition video, digital stabilization, and a macro/landscape toggle switch--all of which we've seen in models such as the Kodak Zi8--the Camileo S20 has a handful of pocket-camcorder firsts, including an LED light for shooting in the dark, a time-lapse mode that lets you select between three preset intervals, four white-balance presets, and a slow-motion mode that helps you take (very grainy) footage of fast action. It shoots AVI files in 1080p or 720p at 30 frames per second, recording the video footage to a user-supplied SD or SDHC card. Instead of the candy-bar design employed by the vast majority of pocket camcorders, the Camileo S20 shoots in a pistol-grip style, thanks to a flip-out, swiveling 3-inch LCD screen; it's a Sony Bloggie MHS-CM5 on a no-carb diet. The adjustable screen is great for composing odd-angle shots (filming over a crowd or taking self-portraits, for example), but it's not the sharpest screen we've seen, and it looks a bit dull in direct sunlight. That said, it's big and adjustable enough to get the job done as a viewfinder. In low light (without the LED lamp on), the Camileo S20 brightened up the scene enough to show what was going on, but footage took on a tan, slightly muddy quality. Motion looked smooth, but color accuracy and white balance were lacking compared with our low-light champs, the second-generation Flip MinoHD and the third-generation Creative Vado HD. The Toshiba Camileo S20 also has two more low-light shooting aids: its front-facing LED lamp, and a ISO-boosting shooting mode. Here's how the camcorder's low-light shooting looks in both of those circumstances: better, but with more visible graininess, especially in the high-ISO mode. The Camileo S20 also takes 5-megapixel photos (and, according to its on-screen menu, up to 16-megapixel photos at its maximum-resolution setting), but you'll need a steady hand when shooting stills. I got shaky, blurry images when my hand moved slightly while taking a shot; if you use a tripod, image quality is about on a par with that from an above-average phone camera. Despite all the fun features, the Toshiba Camileo S20 has a few notable drawbacks. For example, it has no flip-out USB connector; instead, Toshiba includes a separate cable in the box for charging your battery and offloading your clips. Also, digital image stabilization is available only in the camcorder's 720p/30 fps mode, meaning you don't get that option for the Camileo's highest-resolution video setting or even in its lower-resolution, Web-friendly video modes. It's nice to have the macro/landscape toggle, but the macro mode doesn't allow for extreme close-ups; the closest I was able to get to a subject and shoot a clear shot was about a foot away. And the camcorder has an all-plastic build, which definitely makes it feel a bit cheap (but also slim and light, and probably fairly durable). When shooting with the Camileo, I found the main drawback to be its menu navigation, which is especially frustrating given the amount of goodies at your disposal. Top-level menu navigation is done with the thumb-operated zoom control, which is fairly responsive but feels cheap and plasticky. Pressing the center of the zoom control would be the most intuitive way to make on-screen selections, but instead, you sometimes have to use the two small buttons below it to dive into on-screen menus. When you're using the same zoom control for operating the 4X digital zoom, it's insanely touchy. At times, I was able to slowly zoom in and out, but at other times, the zoom control jumped between zoom points or rocketed to full telephoto. As with most pocket camcorders, it's best to refrain from using the zoom at all; only the 5X optical zoom on the Sony Bloggie MHS-CM5 stands out here. The Toshiba Camileo S20 is definitely among the top tier of current HD pocket camcorders, thanks to the useful LED lamp, decent 1080p footage, and unique extras--all for less than $200. But a handful of usability issues, not to mention its cheap-feeling build, prevent it from landing at the top of our pocket-camcorder list. For sheer bang for the buck, look no further than the fun-filled, 1080p-shooting Toshiba Camileo S20. It's unsurpassed in features, but we've seen better usability and build quality.